Luxury penthouse 3 double bedroom apartment. Luxury penthouse apartment with roof terrace and stunning views. 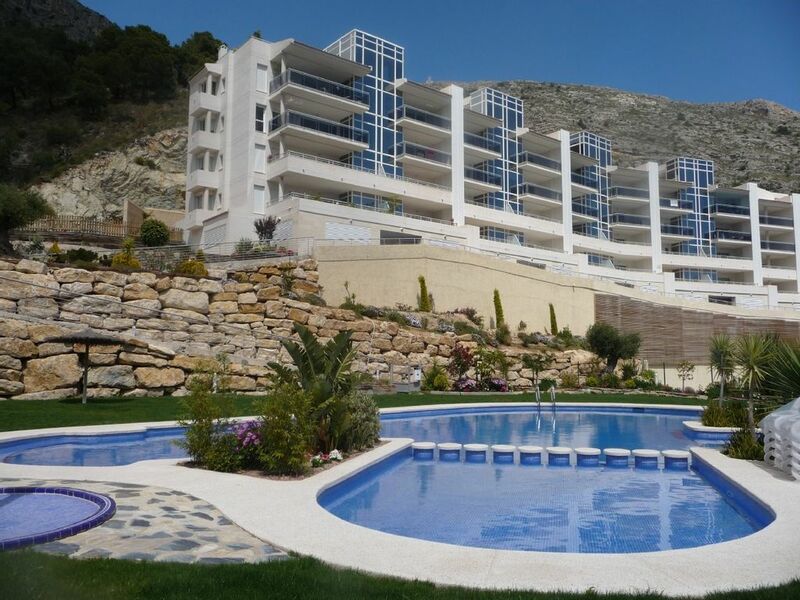 This luxury apartment is situated in the Jardines de Altea Hills complex. The complex is close to the 5* Altea Melia Hotel whose facilities (indoor and outdoor pools, sauna, gym) are available for use by apartment residents (charges apply). The apartment has spectacular views and overlooks the private complex swimming pool (top left apartment in photo). It has a spacious lounge and dining area, which leads directly onto the large balcony, and a spiral staircase leads to the beautiful roof terrace, which has both comfortable seating and a further dining table for 8. There is a table football game in the adjoining upstairs room. The master bedroom also leads onto the balcony and has an en-suite bathroom. There are a further two bedrooms, one with double bed and one with twin beds. The apartment has a family bathroom and a fully equipped kitchen and utility room. The apartment also has English TV and wireless broadband. Please note that a car is necessary. We have had a lovely holiday staying at this apartment. It is so comfortable that we literally felt like we packed up our home in the UK and brought it to Altea. Lots of space for our family of 4 with 2 grown up/teen sons. It is set up in the hills so you need a car but we liked the location as beautiful views plus easy to get to either Altea or Calpe and so everything you need is just a 10 minutes car journey at most. All contact with both the owner and the local caretakers was quick and easy. This is a beautiful apartment and we are already thinking of a return visit. Thank you for taking the time to review our apartment. We're pleased to hear that you enjoyed your stay! Excellent facilities, super clean and the most beautiful view. 100% recommend to anyone looking for a self catering holiday where you can relax, explore the wonderful coast and get away from it all. thanks you Mr and Mrs Bishop! Fabulous apartment with lovely views. We spent 6 delightful winter weeks at this stunning apartment and enjoyed it so much we have booked again for this winter. Located in a well kept, quiet residential area the apartment is on a hill with lovely sea views from the open plan living area and the master bedroom. Not only is the interior very well designed and extremely comfortably furnished but so is the south facing balcony and the large, sunny roof terrace. Even in December/January, we were fortunate to have lovely weather, so breakfast on the balcony, looking out at a bright blue sea, was a perfect start to the day. With excellent produce available from the local shops and markets we enjoyed our evenings cooking in the well equipped kitchen or on the gas BBQ. Booking was easy and straightforward with the owner responding to all our questions and e mails quickly. On our arrival we were met by Anita and Stuart, the owners helpful local representatives. They provided a lot of useful local information and it was good to know they were on the end of a phone should we need them. Altea, with its long promenade dotted with numerous restaurants, is an unspoilt natural town. The busy, newer part has everything you could possibly need, while the old town, with its beautiful church and narrow roads, is well worth exploring. Wonderful large clean apartment. Stunning views. Beautiful, quiet complex. Very family friendly and secure. Clean and safe pool. Apartment was lovely and clean. Well laid out and a real plus to have a roof terrace with BBQ area. Parking quite tight so don't hire a large car! Wonderful large beaches in Calpe and Altea. Altea old town is stunning with great places to eat and shop. Guadalest castle is a must to visit. Great holiday to relax and unwind. This was our second visit and yet again it did not disappoint. The apartment is very spacious, bright and airy and well equipped. It is situated in a good location within the complex, the balcony overlooking the pool area. The roof terrace is a bonus and a lovely relaxing area for a BBQ if you fancy a night in. The views from both the balcony and roof terrace are beautiful. We hired a car for both our visits and this is a must. There are loads of places to visit nearby. Altea old town has some fantastic restaurants as does Marina. If you just want to relax around the pool there are plenty of sunbeds. It is a hidden gem. Looking forward to going back again in 2012.
we had a lovely week at this apartment in Altea Hiils. The apartment is very bright and, in general, well kept. I agree with the review before this, that a second pair of keys and the keys to the gates next to the swimming pool would have been very nice, since it is a more convenient entrance and would have made getting in the parking a lot easier. Also, some extra bed linen and towels would have been welcomed. But as I said, we really enjoyed our stay and wouldn´t mind repeating. Altea Town - 2km, Calpe - 6km, Benidorm - 13km, Moraira, Javea, Denia all within easy driving distance. Mundomar animal park, Terramitica theme park, Aqualandia water park all near Benidorm 13km. Guadalest castle and reservoir 45 min drive. Deposit 25% payable when booking - this is non-refundable. Balance to be paid 8 weeks prior to arrival date. A refundable breakages deposit of 200 EUROS will also be payable upon arrival. A cleaning fee of 100 EUROS is also payable upon arrival. We are happy to offer a reduction in the rates for longer term rentals.